The holiday shopping rush is just around the corner. E-commerce sales are headed for "double-digit" growth this holiday season, according to the National Retail Federation. A 7-10% increase is being projected, a tally that will surpass $117 billion, predicts Internet Retailer. Overall, think tanks are forecasting a 19% increase in e-commerce sales through December, 2016. While retailers are excited about making lots of sales and moving inventory, many are still overlooking their return policy. The failure to integrate an efficient and hassle-free return policy could have a serious backlash on present and future sales. The current online shopping experience at a glance. It's a pretty straightforward online shopping experience these days. Using your preferred device (desktop, laptop, tablet or smartphone), you can window shop online stores and their various offerings to your heart's content. Once you find a product that you like, it usually requires just a few clicks to complete the purchase. Some online stores allow you to checkout by using your preferred social media credentials, which sidestep the tediousness of having to fill out a guest profile or having to create a user account. If you are using a digital wallet - such as Apple Pay, Samsung Pay, PayPal Express or others - this checkout process can be sped up even more. Retailers have spent countless dollars researching and developing the most efficient way to get an online shopper through the checkout process. The results have yielded reduced cart abandonment rates and higher conversions. But what about the reverse funnel? What about when a shopper has to return an item they purchased? This is where it gets tricky at many online stores. The people have spoken. They want a return process that's just as easy as the purchasing process. The after-buying experience should be as convenient as the buying experience. Wise retailers to the likes of Amazon, and its subsidiary shoe store, Zappos, as well as premier retailers like Nordstrom's, have heeded the call. So why are other retailers not getting on board? With just a few proposed changes, returns wouldn't be a hassle for anyone, and profits would soar. E-commerce is a multi-trillion-dollar business. 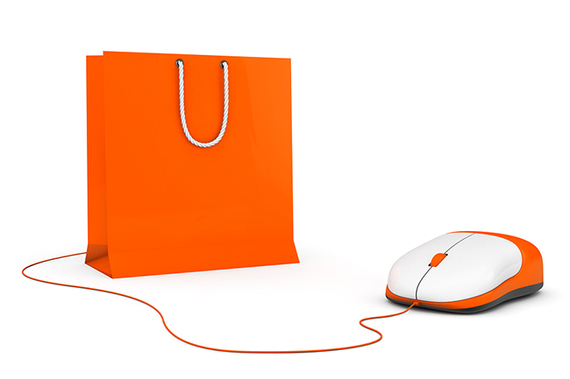 Let's first take a look at the e-commerce industry as a whole. A recent eMarketer report, "Worldwide Retail Ecommerce Sales: The eMarketer Forecast for 2016," helps us better understand just how much of a money-making machine e-retailing is. They've predicted that e-commerce sales will reach $1.915 trillion this year, a 6% increase from last year. By 2020, they'll exceed $4 trillion. With this much cash coming in, you'd imagine retailers could easily afford to offer hassle-free returns. Yet many refuse to. One reason is that the return rate is so high in e-commerce (which we'll delve into in a minute). Another reason is that retailers like larger profit margins; even when they come at the cost of reduced consumer loyalty and or long term retention. About one-third of all e-commerce orders are returned. Over the past five years, numerous studies have been conducted to derive the average e-commerce return rate. As of late 2013, a Wall Street Journal report found that one-third of all internet transactions resulted in a return by consumers. Since that time, various think tanks have concurred that the return rate has not changed all that much. But there is a kicker: Retailers are usually more at fault for returns than consumers are. 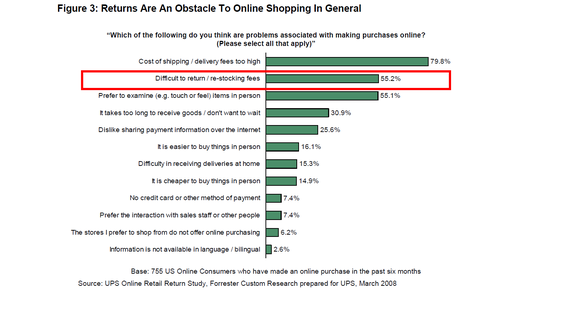 Most e-commerce returns are the retailer's fault. A 2008 Forrester study, which was conducted on behalf of UPS, found that e-commerce returns were the retailer's fault in 65% of all cases. 22% of returns are due to the difference in product appearance. 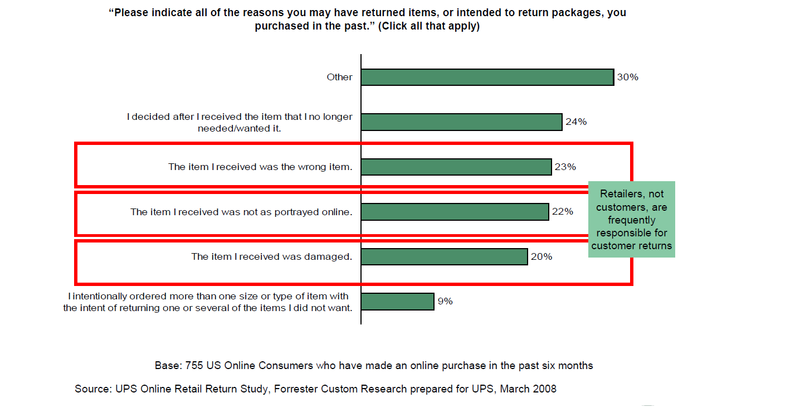 20% of returns are due to a damaged item being received. This, coupled with high return shipping fees or restocking fees, has made consumers increasingly hesitant to order products from online stores. 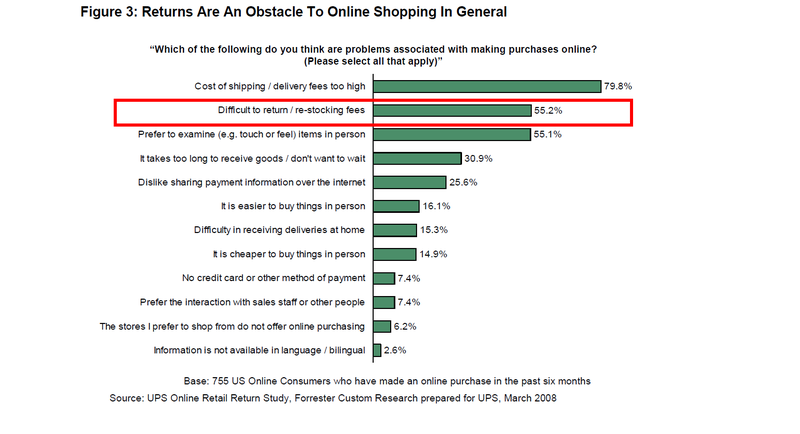 The same Forrester study also found that 55.2% of consumers disliked online shopping due to products being "difficult to return" or the associated restocking fees and or return shipping fees. Consumers read retailer's return policies often. Consumers are wary of having to make a return. Since online shopping is unlike a brick and mortar store, they can't touch the item or see it in person before clicking the "buy" button. They also don't want to worry about it being a difficult process to return the product afterwards. Most consumers take the time to read the return policy of an online store before they even consider making the purchase. A ComScore study that was conducted on behalf of UPS in 2014 found that more than 60% of shoppers actually read your return policy before completing a sale, and that the return policy ultimately influences 80% of the sale. Still, many retailers are not paying attention to these innate facts. Brick and mortar retailers still have the upper hand. The truth is that brick and mortar stores have the advantage with a return policy. For example, retailers like Target and Best Buy make it simple to return any item. A consumer need only stop in at any of the franchise stores and visit the Customer Service counter to return a product that didn't work out for them. For a majority of consumers, this is a much easier process than having to package an item, request an RMA, get their return shipping label and visit a drop-off location to send the package back. What's more, e-commerce returns can take time to process, due to return shipping periods and returns processing on the retailer's end. This also means that customers are left waiting for the return to credit back to their payment accounts, which creates another source of frustration. Sales improve with a convenient online return policy. The most baffling part of this equation is that emerging studies are finding that sales, customer loyalty, long term retention and word-of-mouth drastically improve when a hassle-free returns policy is in place. Take this CNBC report, for example. It's entitled: "Offering Free Returns Can Boost Online Purchases 357%." "Using surveys and spending data, researchers tracked the habits of customers over 49 months at two leading online retailers. After a free-return shipping policy was instituted at one of the retailers, average spending per customer increased by $620 over two years. At the other, it went up $2,500." Or how about this Science Daily article, which followed 26,000 customers over a six-month period. Using control groups, the study concluded that when hassle-free returns were offered, profits improved immensely. "When managers took into consideration not only the cost of the return process but the positive effect of returns on customers, and targeted marketing accordingly, they brought in $1.8 million compared to the control group's $1.22 million. By paying attention to the product returns instead of ignoring them or swallowing them whole as a necessary cost, managers were able to strategize ways to reduce the cost of the return process overall." Current product return facts tell the real story. The most current ecommerce product return facts paint the full picture. 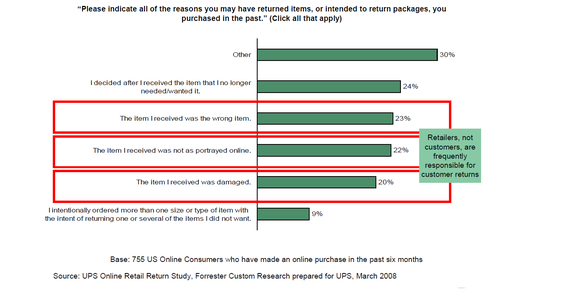 About one-third of all products ordered online are returned by consumers (WSJ). When free returns are offered, sales can increase by as much as 357% (CNBC). Automation is possible with the right software. Currently, there are only a few options for retailers seeking to integrate a product returns system into their online store. Amazon marketplace sellers immediately benefit from Amazon's Return Center, which fully automates returns. Similarly, eBay retailers also have a way to offer them via Returns on eBay. But what other solutions exist for retailers that are selling outside of these popular sales channels? Newer solutions like ReadyReturns automates product returns, with direct integrations offered for most shopping carts. Certain shopping carts also feature returns apps, like Shopify, which lists several options in their App Store. Depending on which sales channels you're selling on, likely there is an automated returns solution that you could be offering. Given the information that you've just been provided with here, the smart choice is to start making product returns just as easy as the purchase was. Otherwise, consumers will just start shopping somewhere that does. ReadyCloud, a cloud-based ecommerce CRM software solution. As an established digital marketer, Lazar's posts are syndicated nationally in a wide variety of mediums. You can follow his e-commerce blog Here.